Many important research and industrial processes require vacuum in what is referred to as the "fine vacuum" range, which is between 0.1 and 0.001 Torr. In a prior post, we talked about the fact that the Pirani style gauge is often the best option in the fine vacuum range. VACUUBRAND offers fine vacuum control packages in two sizes: one with KF DN 16 flange connections, and a second with KF DN 25 flanges to support larger pumps. 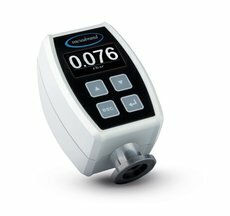 The fine vacuum control packages can be used with any pump capable of fine vacuum depths, including VACUUBRAND's rotary vane and ultra-low-maintenance Chemistry-HYBRID pumps. VACUUBRAND's fine vacuum control package can provide programmable control for critical vacuum processes, like molecular distillation for the purification of oils. A patented chemical- and shock-resistant vacuum sensor sends signals to a digital controller that operates a chemical-resistant solenoid valve. The controller can produce vacuum steps and ramps, and store up to 10 processes. At VACUUBRAND®, we are experts in vacuum for science. To learn more about our fine vacuum control packages, as well as our laboratory and OEM vacuum pumps, please visit our website or email us.